The above image (clipped from an Equifax report) shows a first mortgage balance of $216,000 and an amount past-due of $20,536. 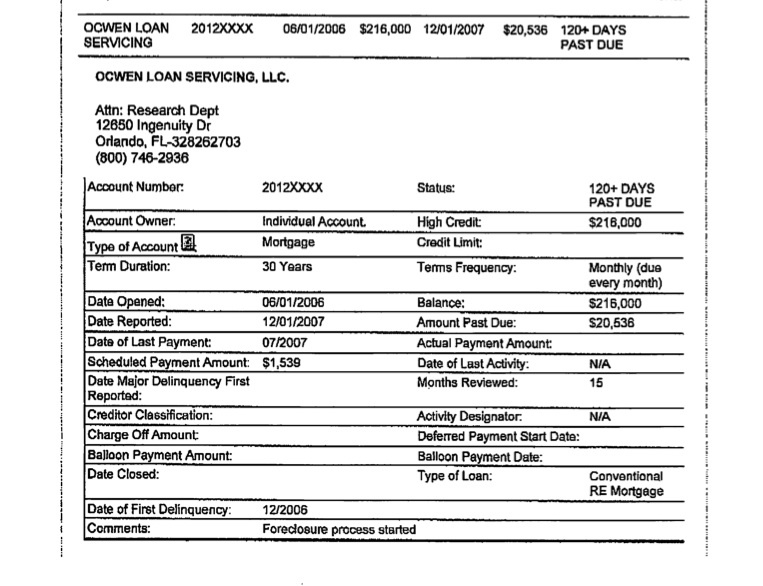 It also shows this account is related to a foreclosure from around 2007. If the client confirms that the foreclosure was in Minnesota, was completed and that there was not a lawsuit related to this foreclosure, then it is VERY likely that the public records will show that the balance was SATISFIED through the foreclosure and that NO amount is past due. The public record should be checked and then forwarded to the CRAs that are reporting the balance. If the CRA fails to correct the record by zeroing both the balance and amount past due, it's an FCRA violation for its failure to reasonable investigate the dispute. There could also be an FDCPA violation if the information is 1) verified by the furnisher, and 2) the furnisher is a "debt collector." In other words, look for this!